Steam now offers Hollywood movies for rent, but why? Valve’s PC gaming platform, Steam, has grown steadily to accommodate the changing needs of players, with features like Greenlight to allow indie games into its store, the ability to stream titles from one computer to another and Workshop, which offers in-game items created by the community. For some reason, the company has now decided to host Hollywood movies from Lionsgate for rent or purchase in some countries on Steam. There are more than a hundred of them, including ‘The Hunger Games’, ‘Reservoir Dogs’, ‘Pi’, ‘Dredd’, ‘The Cabin in the Woods’ and the ‘Saw’ series. It’s worth noting that this isn’t the first time Steam has made movies available on its platform. It has titles like the excellent ‘Indie Game: The Movie‘ and ‘Free to Play‘, which focus on game development and esports respectively. It’s hard to see the sense in this. Steam is great for gamers, all 125 million of them on its PC, Mac and Linux-based service. But it’s hardly the first thing people think of when they want to watch a movie. As Kotaku notes, Lionsgate’s pricing will hardly help it compete with today’s TV and film streaming services. The amount you pay to rent two movies on Steam for 48 hours will score you a month of Amazon Prime Video; a dollar more gets you 30 days of Netflix. 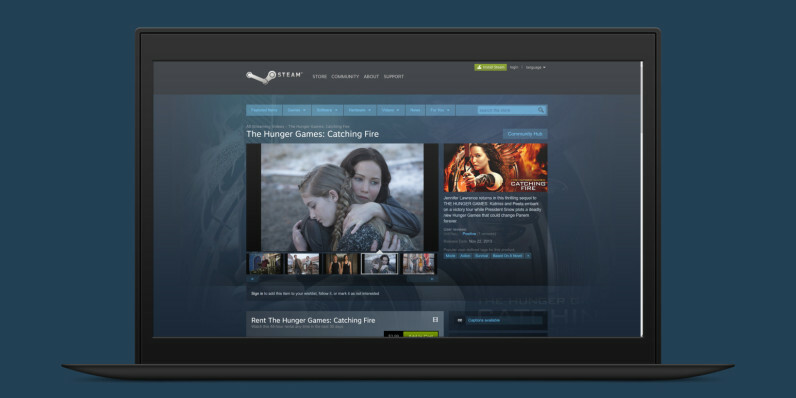 And while you can watch content from either of those on just about any mobile device, console, set-top box-equipped TV or computer, Steam is essentially available only on desktops. In addition, Lionsgate movies aren’t yet available across the globe, which means that the company isn’t even reaching all of Steam’s user base. It’s hard to see this deal paving the way for other movie studios to hop on board Steam. If Valve wants to get into the streaming business, it’ll have to change a whole lot about how its platform works – and likely lose its core gamer audience in the process.